Performance Time: Approximately 90 mins, 89 pgs. CLASSIC. 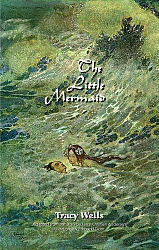 Adapted from the fairytale by Hans Christian Andersen. Melody, a teen mermaid, lives in the undersea kingdom of Undinia with her father, grandmother, older sisters, and her albatross, seahorse, and sea turtle friends. When Melody turns 15, she is allowed to swim to the surface for the first time to view the world above. When she reaches the surface, Melody watches as Prince Dylon is knocked overboard in a storm. She saves the unconscious prince from drowning and lays him on a large rock, where Princess Camilla discovers the Prince and takes him to safety. Desperate to be reunited with Prince Dylon, Melody seeks the help of a fearsome sea witch, who has a potion that will transform Melody’s mermaid tail into human legs. In return, the sea witch demands Melody’s beautiful voice as payment and warns Melody that she will never be able to return to the sea. In addition, if Prince Dylon should marry someone else, Melody’s human body will dissolve into sea foam. Despite the warning, Melody drinks the potion and is discovered on the beach by Prince Dylon, who is instantly smitten with her. But Melody soon learns that Prince Dylon is determined to marry Princess Camilla, who he mistakenly believes saved him from drowning. As the Prince’s wedding day approaches, Melody’s sisters cut off their long hair and give it to the sea witch in exchange for a magic knife, which Melody must use to stab Prince Dylon in the heart in order to save her life. Unable to kill the prince, Melody resigns herself to her fate, but Prince Dylon has another plan in mind. Audiences of all ages will be enchanted with this play’s humor, whimsy, and romance and its timeless themes of selflessness and self-sacrifice.